For years doctors have encouraged parents to store toxic household cleaning products in locked cabinets, out of sight and reach of children. While this advice may have helped considerably, with injury from cleaning products in children declining 46 percent since 1990, a new study demonstrates that children under age 6 years are still at high risk of poisoning and other injuries from cleaning products in the home. Spray bottles are the most common source of injury, and bleach is the most common agent. Despite our best efforts, exposures and injuries are still common. US poison control centers still receive hundreds of thousands of calls each year because of unintentional poisonings from cleaning products. Each call is more than a statistic; it’s an important moment in the life of a family. And nearly 12,000 children were sick enough to be treated in US hospital emergency departments in 2006 alone. To me, the old childproofing strategy has become out of date. Children are still being harmed. We haven’t seen much improvement in overall injury rates since 1996, and injuries from cleaners in spray bottles have actually increased. Meanwhile, effective non-toxic cleaning products are now available to get the job done at home. When it comes to childproofing, I now recommend that expectant mothers and parents of young children replace their toxic household cleaning products with safer alternatives – reducing the risk both of immediate injury and of ongoing low-level exposure to dangerous chemicals. The Center for Injury Research and Policy reviewed 17 years of ER data for children under age 6 to analyze the landscape of injuries from household cleaners. The results will be published in the September 2010 Pediatrics. Children age 1 to 3 account for 72 percent of injuries. One-year-olds alone account for 46 percent of injuries. Boys (59 percent) are more likely affected than girls (41 percent). 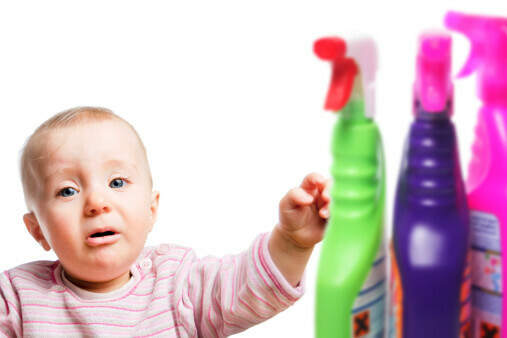 More than 80 percent of poisonings occur while at home. Poisoning is the most common (68 percent), followed by chemical burns (16 percent) and other injuries to the skin or eyes (10 percent). Spray bottles are the most common source (40 percent), followed by regular containers 30 percent), kitchenware (14 percent) and recently cleaned items (8 percent). Bleach is the most common product ingredient (37 percent), followed by hydrocarbons, acids/alkalis, detergents, and ammonia. None of the children’s injuries that resulted in the 267,269 emergency department trips in the study was necessary. Effective, safer ingredients are now available for every common household cleaning job. Why should a parent who drives with a car seat clean with out-of-date chemistry? For parents of children age 6 or under, doctors’ advice to lock-up toxic cleaners is no longer adequate. Instead, childproof by replacing products whose labels must say Danger, Warning, Harmful if Swallowed, or Use in a Well-Ventilated Space. If the label gives instructions for calling poison control or for emergency treatment, the product is dangerous. Poisonings, burns, or other injuries from household cleaning products never need to happen again. Any injury to a child from a household cleaning product is one too many.